Exercise could lead to a feeling of accomplishment, feeling stronger physically, improved health, and an increase in confidence to stay drug and alcohol-free. Everyone knows that there can be enormous health benefits that come from a regular physical activity. Exercise helps people stay physically fit, improves cardiovascular health, and aids with weight loss and maintenance. But did you know that it can also be especially beneficial to people in addiction recovery? Especially those who have just completed drug or alcohol addiction treatment. If you are in recovery from drug or alcohol use, especially early recovery, you may not exactly feel like getting outside and going for a run. In fact, it may very well be the last thing on your mind as you work on maintaining your sobriety. 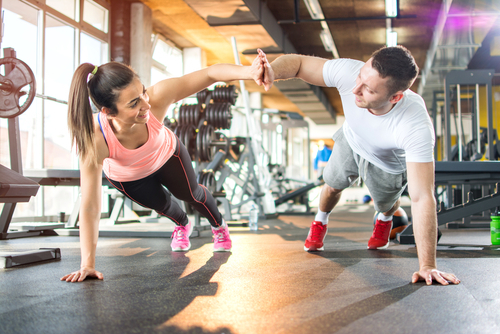 But the fact is, regular workouts – even walking – can become a positive addition to your program of recovery and can help lower your risk of relapse. In a study published by the US National Library of Medicine and National Institutes of Health that followed patients who were being treated for substance abuse, it was shown that exercise could lead to a feeling of accomplishment, feeling stronger physically, improved health, and an increase in confidence to stay drug and alcohol-free. Additionally, exercise can provide you with a natural high that replaces the artificial ones you were chasing with drugs or alcohol. As a person is recovering from addiction, he or she will have cravings for the endorphins that resulted in the high that he or she became used to while using drugs. Exercise that increases your heart rate will cause your brain to release those same endorphins that can induce feelings of euphoria, and that can make it easier for you to deal with life in recovery. Of course, the endorphin high that you feel from jogging around the block is not going to be as intense as what you felt when you were using, but it can provide a pleasurable experience for many recovering people. Besides the chemical changes in the brain that can help you when you’re physically active, exercise can alleviate the negative physical effects that giving up your drug of choice has caused. It can help with stress, sleep problems, anxiety, depression, and weight gain. By improving your overall health, exercise helps your body heal from the damage done by your substance abuse while improving mood and emotional well-being. You’ll get better sleep. Addiction affects many body systems, including the circadian rhythms that control sleep patterns, and it can take quite a while to return to normal. Regular exercise can help your body restore its natural sleep cycle faster as your body heals. You’ll heal your body and brain faster. You know that any kind of physical activity will help you prevent medical issues like diabetes, heart disease, some types of cancer, and immune system issues. What you may not know is that regular exercise for people who are in recovery can also increase the number of new nerve connections forming in the brain – a huge help in healing from addiction. You’ll fill your time positively. When you are in recovery, having too much time to think or being bored can be risky. If you have time to daydream or fantasize about using again, your cravings may take on a new level of intensity and put you on the path to relapse. Filling your time with positive, constructive activities is crucial to early recovery. When you make it a priority to add a program of exercise to your recovery, it takes up time in your schedule – time that is well-spent and positive. You’ll have an outlet for feelings of anger. Feeling angry is very common in early recovery, so it’s likely that you will feel it to some degree. Physical activity provides you with a healthy outlet for that anger. If jogging is your workout, consider adding sprints at certain intervals. That will burn off some of the anger or other negative emotions you may be feeling. You’ll feel more confident. Exercise will increase your self-confidence the more you practice it. Like any new endeavor, the more you practice, the better you get. As you become more comfortable with your exercise routine and you continue to get stronger, you will feel a sense of accomplishment and self-confidence that may have been missing. These are important aspects for people in recovery who are striving to feel better about themselves in their new sober lives. If you haven’t exercised before, or if it’s been a long time, start slow. For example, if you are considering running as a program of exercise, start by walking, jogging, or a combination of the two. Build up slowly so that you don’t get frustrated or overwhelmed by trying to do more than your body is ready to do. If you have someone to walk or jog with, that will also add to the benefits of exercise. You can build relationships as you are rebuilding your health. If you or a loved one is suffering from addiction, Life of Purpose can help. We offer treatment programs in Pennsylvania, New Jersey, and Florida. Please contact us today at 1-888-787-7673 for more information about how to get help.